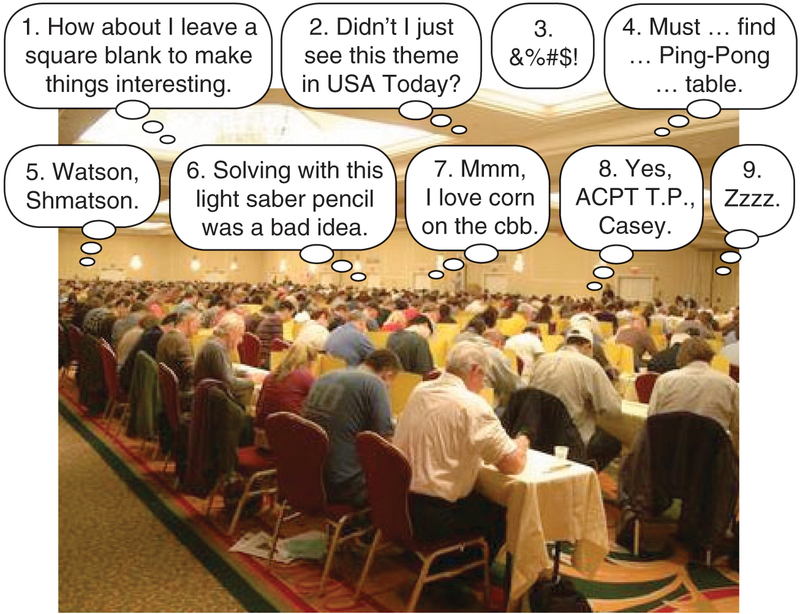 A trio of snapshots from the American Crossword Puzzle Championship. I took blurred photos, then made adjustments in Photoshop, including the addition of a watercolor effect (it shows up more when the photos are enlarged). The last shot is a rare photo of Don Christensen, the man who takes pictures of everyone else over the weekend. Don is about to capture Will Shortz and Mike Shenk, the final-puzzle constructor, for posterity … and hopefully not fall off the stage. 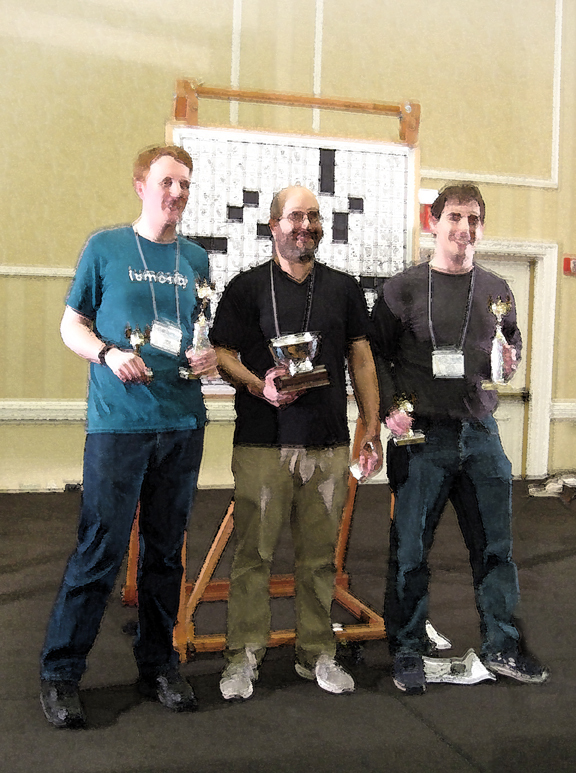 By chance, about five years ago, I heard that Will Shortz would be hosting a small get-together at his house for a few puzzle friends. That didn’t involve me, but an annual crossword tournament Will holds in his hometown the week before — that would. The event is always followed by a trek of the puzzling faithful to stately Shortz manor for snacks and drinks and hobnobbing. After the tournament, while clogs of puzzlers were clustered in Will’s kitchen, dining room, and living room, I planted a small puzzle hunt around the house. There were three clues. Each was a 4-line poem on a small piece of paper giving a hint as to the location of the next clue. On the day of Will’s party, I sent him an email explaining what I’d done. At the end of the email was another 4-line poem to start the hunt. The first clue was hidden in a vase on his mantel, not far from a Rotten Tomatoes award for the best-reviewed documentary of the year, Wordplay. Where was the second clue? I’m not remembering. But the third one was inside a fake can of Coca-Cola in a kitchen cupboard otherwise filled with cans of Campbell’s Chunky soup. Its message led to the “prize” I’d squirreled away in the back of his freezer, a small container of mustache antifreeze for use during the upcoming winter. I’ve never asked if he’s used it, but I suspect not. “No” can take many forms, as can be seen by sifting through the stack of rejection letters I’ve received from publishers over the years. Here are some actual quotes. • It’s not right for us. • Your work has not been chosen for publication. • It is not a book we could take on at the present time. • In the end, it wasn’t something we felt strongly enough about. • I think it’s wonderful, but I don’t see how it would work in our hands. • Our editorial board does not think we could do justice to your efforts. • Though your ideas are very interesting, we feel we must pass on this. • Although I love your dry sense of humor, I don’t think that this story is right for us. • This is a delightful book that I don’t have a clue what to do with. • I think you’ve got a fascinating idea here and one that could sell well if you can find the company that can sell such a thing. How about something with mice? • I really like the little mice, but we have had no success with rodents. • I’m sure by now you’ve made a deal elsewhere. • We encourage you to continue submitting this package to other companies. • I have no doubt you’ll find someone else to publish it. • We just didn’t find it catchy enough. • I’m afraid I did not see the material clearly. • I just didn’t respond emotionally to this story. • Your submission was not considered particularly humorous by our personnel. • I’m pretty quirky, and like a good laugh, but this is a bit strange, even to me. 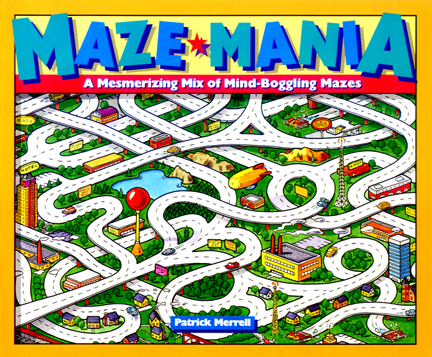 A publishing exec named Roy Wandelmaier, while rejecting a proposal, asked if I’d like to create something his company had a lot of success with, a maze book. Maze•Mania and five titles that followed combined to sell over a million copies. Tommy Lee Cook brought his bluesy vocals to the talent gig at this year’s xword champeenship, whilst leaving his howling guitar back home at the “World Famous” Buckingham Blues Bar in Ft. Myers, Florida. 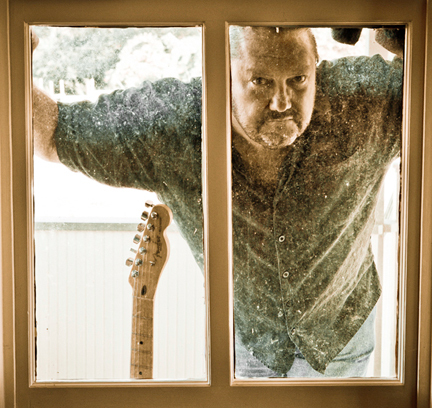 However, guitar and voice can both be heard HERE. Click on either image to enlarge (and then click on the enlarged image to make it even bigger). 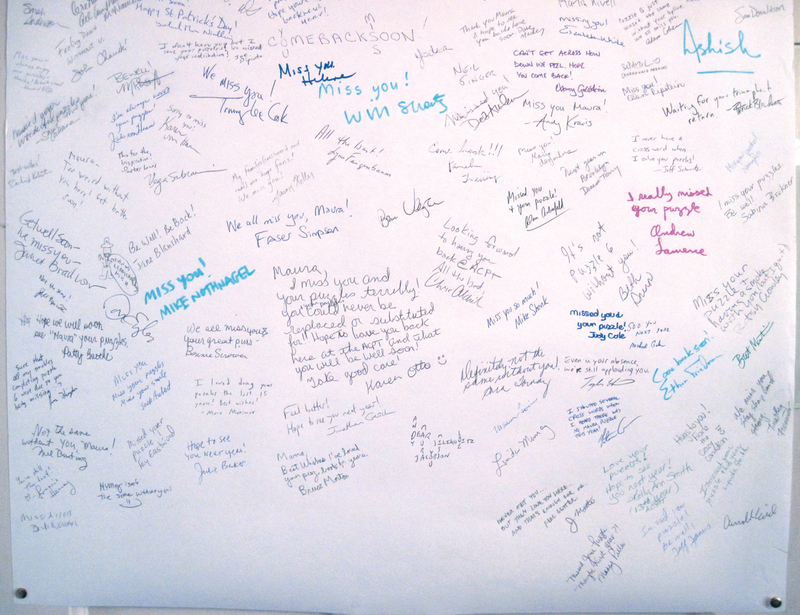 These are the top and bottom halves of the big card for Maura Jacobson that people signed at the ACPT. For the first time in the 35 years, Maura Jacobson had no puzzle #6 in the tournament. And for the second year, she wasn’t in attendance. 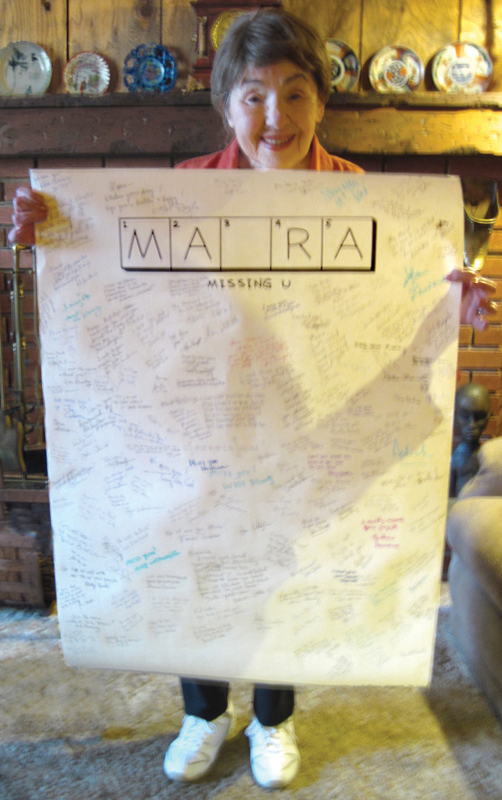 But Maura was not forgotten. 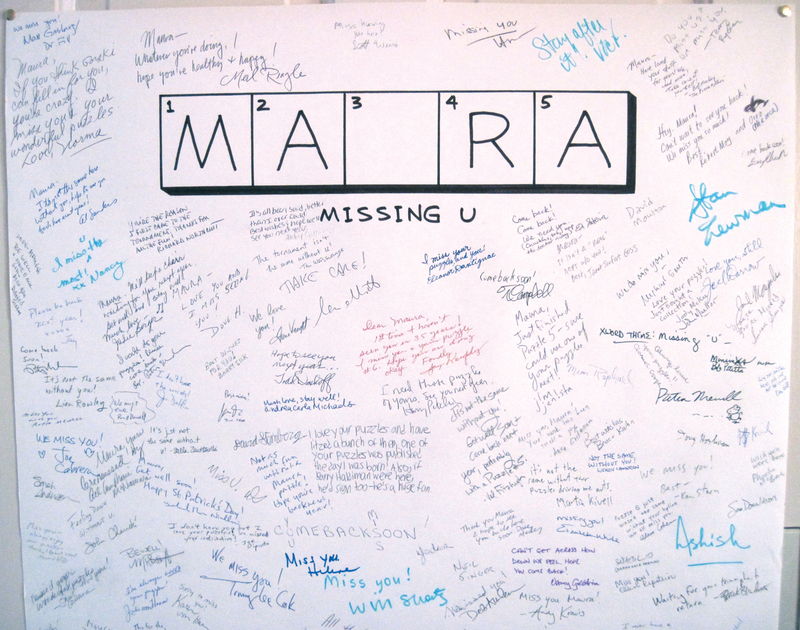 A giant card made up specially for the occasion (with “MA _ RA” across the top and “missing U” beneath) was posted outside the ballroom, and it was soon covered with signatures, thoughts, well wishes and puzzling love. I drove it over to her house Tuesday afternoon, and … well, I think the grin in the photo tells the story. I stayed for just over an hour, sipping ginger ale and trading crossword stories with her and her husband Jerry. I then hit the road, leaving her to solve the rest of the crossword atop her card. Most years, I’m one of the judges assigned the job of preparing the nine oversize boards for the finals. It’s a two-step task: affixing black cardboard squares (with tape rolls on their backs) and correctly writing numbers in the proper squares. High-tech, no? It was suggested that we recycle the black squares from the C final, after it ended, hastily transferring them to the A boards. An incident from an earlier tournament immediately came to mind. 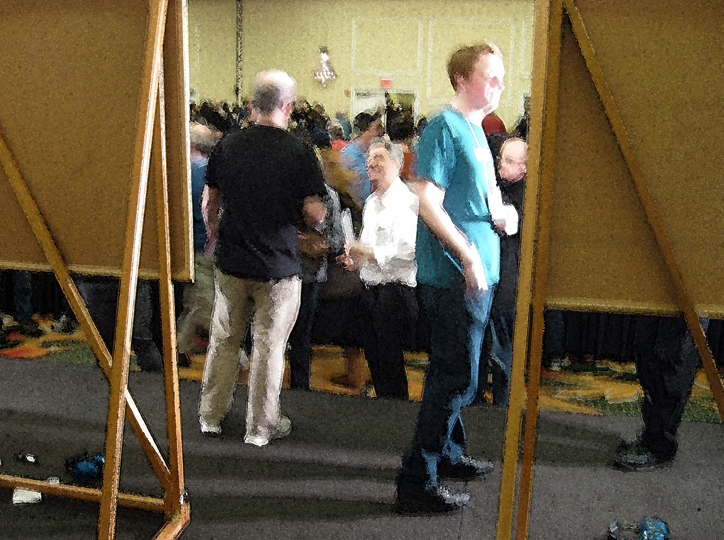 Joe DiPietro and I had been in charge of monitoring the contestant Arnold Reich’s progress during the B final and, about five minutes into the solve, Joe whispered that a black square was missing from Arnold’s board! Seeing the square lying on the floor nearby, I ran over and picked it up, jumped on stage and stuck the square in its spot. Merl Reagle, doing the color commentary, announced to the crowd, “there appears to be a board malfunction.” Luckily, Arnold hadn’t gotten to that area of the puzzle, and he later told me he hadn’t even noticed what I’d done. So we eschewed the black-square-transfer strategy and decided instead to see if there was a roll of black duct tape in the hotel. As I approached the front desk, I noticed a maintenance worker walking toward me — with a roll of black duct tape in his hand! Seriously. Nothing but that single roll of black tape. 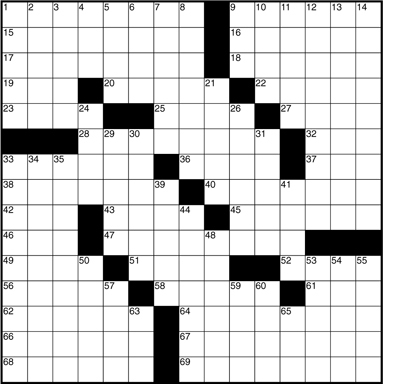 I explained my crossword emergency, he obligingly yielded his pelf, and our black square problem was solved. Note: The A and B finalists solved with official cardboard squares. The C’s got the black-tape version. Will Shortz loves his table tennis, so much so that he keeps track of how many consecutive days he plays. With the tournament foofaraw seriously clogging up his schedule this past weekend, he was in danger of breaking his streak. But not to worry. On Saturday night, when the festivities ended at about 11:00, he dashed for a cab that would take him to SPiN, a high-end table tennis mecca in Manhattan. He made it in time and has now played something like 80 days uninterrupted, with the next 100+ days of his calendar looking good to keep the streak alive and growing. You are currently browsing the archives for the Puzzling Thoughts category.